The battleship Iowa (BB 61) arrived at Ingalis Shipbuilding division of Litton Industries in Pascagoula, Miss., recently for completion of her modernization and reactivation. The 58,000-ton ship had been in New Orleans, La., since September 1982, where Avondale Shipyards Inc. performed drydocking work and equipment removal under subcontract to Ingalis. Ingalis recently received a finalized contract worth more than $177-million for completion of the modernization and reactivation. The contract includes $39.2-million previously awarded for planning and preparation, drydock and prefabrication work, and procurement of long-lead time material. The ship is scheduled for redelivery to the Navy in June 1984. While at Ingalis, Iowa will be fitted with Tomahawk cruise missiles, Harpoon antiship missiles, Phalanx Close In Weapons Systems mounts for self-defense against aircraft and missiles, air and surface search radar systems; and helicopter launch and recovery facilities. The ship's nine 16-inch guns and 12 of 20 original 5-inch guns will remain. While the Iowa contract will not increase employment at the shipyard, it will be an important factor in stabilizing current manpower levels. The work will employ some 1,500 people for about 18 months. "Returning Iowa to our Navy's Fleet will be a challenging opportunity for our employees. The award of this contract reflects our company's reputation with the Navy for high quality work and schedule achievement," Leonard Erb, president of Ingalis and senior vice president of Litton Industries, said. Ingalis will also overhaul the ship's eight boilers and four geared turbine engines of 53,000 hp, converting them from obsolete "black oil" fuel to the Navy's standard distillate fuel. Advanced electrical power and communications systems will be installed, sleeping and dining areas will be renovated, and air-conditioning will be installed aboard Iowa for the first time. 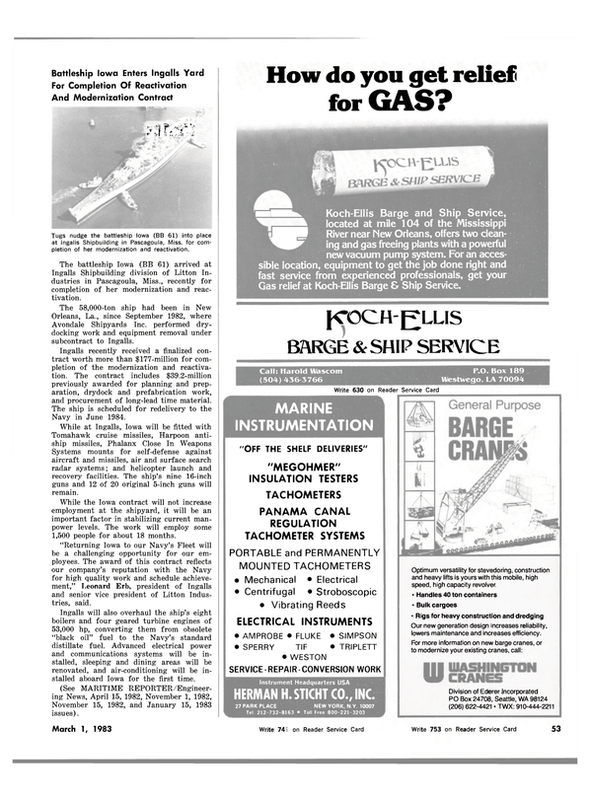 (See MARITIME REPORTER/Engineering News, April 15, 1982, November 1, 1982, November 15, 1982, and January 15, 1983 issues).